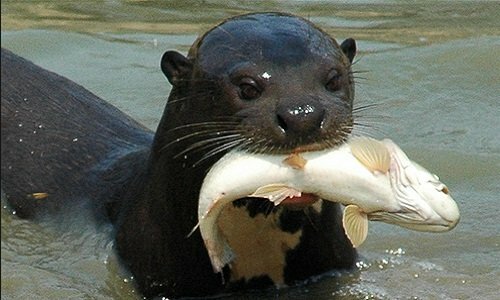 Pteronura brasiliensis, also known as the giant otter, is already extinct in Uruguay and possibly Argentina. In Bolivia populations remain, despite dangers that threaten them. According to the Red Book of Endangered Vertebrates of Bolivia (2010), the otter is considered an “endangered” species; it is estimated that the country´s population does not exceed 500. “These animals have a natural predator which is the jaguar and, in a few cases, alligators, but these only attack the young sporadically. If the otter is in danger, it is due to what in reality is its main threat: man”, explains biologist Guido Ayala, Coordinator of Investigation for the Wildlife Conservation Society (WCS). 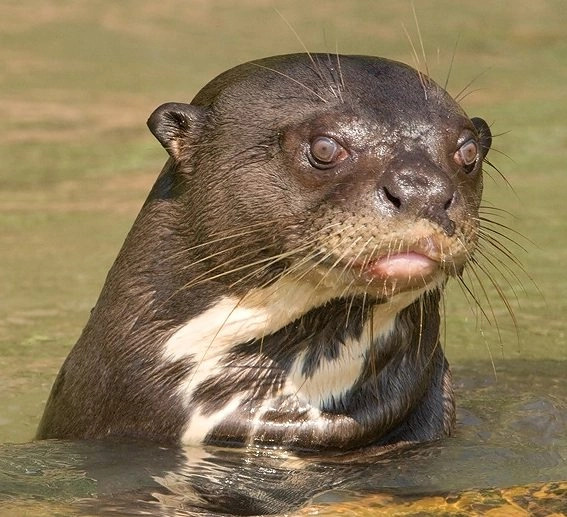 During the last decades, the giant otter has rapidly lost its natural habitat in Bolivian due to deforestation: “Although they have resting caves on the banks, the otters build large burrows where they sleep in the forest. Unfortunately, timber companies often extract tress without following the integral management plans which stipulate, amongst other things, that 50 meters of forest must be left on the river banks in order to avoid erosion”, adds Mr. Ayala. 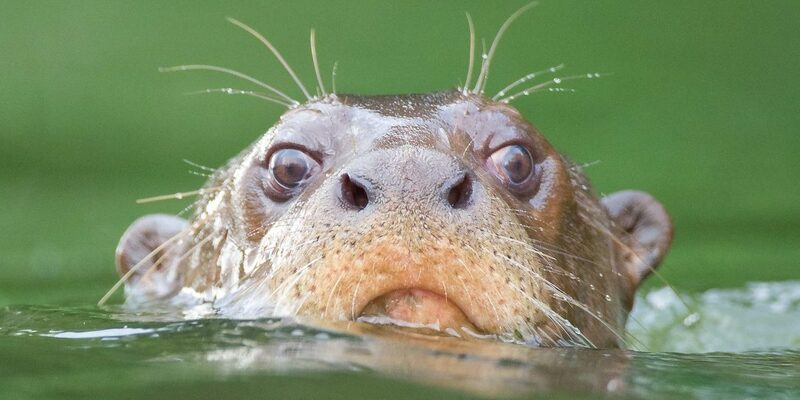 In Bolivia the giant otter is considered “the queen of the aquatic world”. Just as the jaguar dominates the ground, this charismatic mammal of up to two meters long has made its place in the long rivers and lakes of the Amazonian basin. Poaching is another issue which threatens this species. The otter has a beautiful fur, of a dark brown color, highly prized for the confection of coats and other articles. Between 1940 and 1970 hunting was so out of control that it almost caused the total disappearance of the otters. In the year 2000, when WCS arrived at the Rurrenbaque and Madidi River area, community members commented that they had not seen an otter in the area for years. “But in 2001, thanks to the traps-camera campaign, that were designed for jaguars, we managed to capture a photograph of an otter on the Tuichi River. That was the first recording, after decades, of the species in its Parque Madidi habitat”, says Ayala. Upon their discovery, the WCS began to systematically study the behavior of the otter in the protected nature areas. 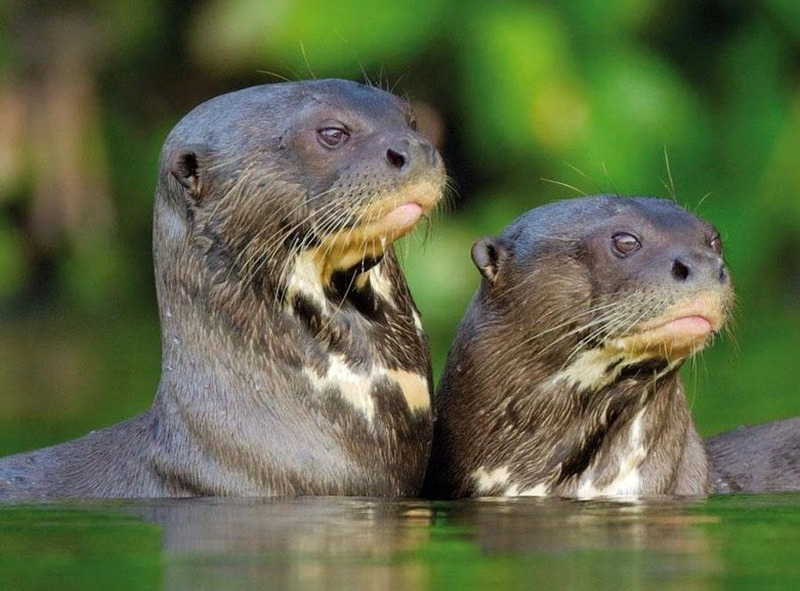 More otters were discovered in areas outside of the Bolivian jungle town Riberalta; most specifically in the Aquicuana Reserve. “We believe that that Northern Bolivia is an interesting habitat for the giant otter population because it is so isolated from humans. To be able to observe these otters biologists traveled up to five days via boat on the Made de Dios river”, the coordinator comments. The otter is a social being that lives in family groups of five to nine individuals. “When they swim the adults always lead in order to observe everything that goes on in their surroundings. If, let´s say, they discover the scientist, they carry out what we know as the periscope; that is, they pop their heads in and out of the water to control where we are and what we’re doing. The younger members of the group stay behind while the adults control “the strange object”, explains Cinthya Jurado, a WCS biologist who based her thesis on the otter. The giant otter is diurnal and sleeps in caves that it builds in the forests and in the ravines of the rivers. All of the members of the family group look after the offspring and are fed by the group. They also help each other during defense and hunting activities. The otter’s spots are particularly unique. These pigmentations are present on the throat and, just like jaguar’s spots and human fingerprints, they are specific to each individual. “The marks are used to identify each specimen we see. Thanks to these, we estimate the densities of the animal in the wildlife, explains Ayala. It is controlled with sensory video cameras, as sometimes the otters hide themselves so quickly in the water that we don´t have time to photograph them. This way we record them and then freeze the images in order to identify the marks they have on their necks”. For the otters, size is important. The body of this mammal can measure up to two meters long and its tail, which it uses to swim, can measure up to 70 centimeters.